It’s our first First-Friday Giveaway of the new year, and do I have a prize for you! Now, it’s not a snow day or an extra pair of hands. If I could figure out how to deliver either one of those, I’d definitely do it! However, this month’s prize is something that can only be delivered from The Mailbox. Take a close look at the photo. In addition to receiving 120 adorable mini erasers, which have multiple uses, the winner of this month’s giveaway wins $25 worth of free digital products from The Mailbox! How cool is that? Be sure to leave your answer before midnight January 15, 2017. We’ll announce the winner right here on the blog, and we’ll also notify the winner at the email address used to submit the comment. Outside Temperature: 46 degrees Fahrenheit (8 degrees Celsius) YIKES! Litchfield, NH 51* way too warm for January! Outside temperature is -3 degrees with a windchill of -20 degrees. Brrrr! It was a chilly 27 degrees at 8:00 AM this morning. A light snow fell last night. Outside temperature : 12 degrees but feels like 4. Well, it was nice here in Wickenburg, Arizona. I walked to school ( and did not see the temp)and there was no frost, so I am guessing it was at least 40 degrees. My tomatoes and pepper are still very happy outside. On the other hand in Vermont there was freezing rain and slippery conditions last night. St. Louis, MO. . .18 degrees! Brrrrr! Buffalo, New York cold and crisp – dusting of snow in the city but south of the city long commute home last night(Some students didn’t arrive home till 7:00pm). Here in Santa Ana, CA we are still on winter break until Jan. 17th. It is a balmy 62 degrees outside. We are unable to make snowmen so winning them is the only hope for my Kindergarten students to be able to see them. It is a balmy -36 degrees here! Hug and Go was amazing! It is normally 51 in Merced, California, today it was 29 degrees and FROZEN! Santa Fe, TN 18 degrees and 2 inches of snow = SNOW DAY!! 32 degrees, feels like 23 degrees. Snow on the ground and more on the way! Temp is -1, but no snow yet! We have the snow day! It’s 30 degrees & feels like 25 right now. West Terre Haute, IN 5 Degrees with a wind chill of -8 degrees. Grove, OK, 19 degrees and NO SNOW! Buffalo, New York cold and crisp – dusting of snow in the city but south of the city long commute home last night(Some students didn’t arrive home till 7:00pm). wish it was warmer only 20 degrees outside. It is currently 57 degrees with a chance of much needed rain! It is 13 degrees but it feels like -3. Michigan winters were named the 2nd “most miserable” !!!! Indialantic, FL and it’s 82 degrees today! 4 degrees felt like 0…indoor recess for the morning. Baraboo, WI we are chilly here with 1°F right now, but will be dipping in negative temperatures soon. My husband is from Baraboo! We are now in Columbus, OH We love to come and visit in the summer. Stay warm! Galloway, OH and a BALMY 18 degrees with a bright sun! trussville alabama(right outside bitmingham) 26 degrees. we had snow this morning. !!! 23 degrees Sunday at noon! Columbia, Illinois ~ 18 degrees! BRRRR! Pt. Pleasant, WV it’s 18 degrees with snow on the ground. Brrrrrr!!! 21 degrees Sunday afternoon with about 6 inches of snow on the ground! Brrrr! I wet to school and lived in Oswego Il! Now a resident of Metuchen, NJ. Newton, NJ 21 and Frosty!!! 12 degrees – major snowstorm! I’m in Mankato, KS and it’s 24 degrees today with a 4 degree wind chill. Brr! It’s the warmest day we’ve had for the last 5 or 6 days. Walla Walla, WA. 18 degrees and an ice storm on the way! It is a sunny day 23 degrees F in Durham, NC. I long for my island paradise. Long Island, NY. 21 degrees Farenheit! Tucson Arizona- 60 degrees- Sorry! Rigtt now it’s a balmy 13 degrees outside… warmest it’s been in several day! Masontown, PA (about 60 miles south of Pittsburgh) is sitting at around 17 degrees! The sun is shining, though, so it looks deceptively warmer than that. Tell City, In and it’s 28 degrees with snow on the ground! West Sioux in Northwest Iowa…Ireton Elementary. Antigo, WI – right now it is 6 feels like minus 1 degrees, but we’ve had several below zero days. Freehold, NJ-Brrrrr!! It’s a chilly 22 here with some snow. Good football weather though! Elyria, OH 16, feels like 2! Hedgesville, WV It’s 20 degrees, windy and snow on the ground. 72 degrees. Ahhh, Phoenix winters. Bladen, NE 24 degrees but feels lik3 10 degrees, brrrr. Rhonda from Taylor Mill KY and it is sunny and 21 degrees outside. We brought the snow into our classroom Friday in the sensory bin. I had some mittens that I use with Jan Brett’s story of The Mitten for the children’s hands and we decided to put cars in the snow so the children could “drive” in the snow. Lots of fun! SAN Antonio Texas. 20 degrees! Icy roads! Anderson, SC 18 this morning were up to 37 now. Palatine, IL 14 degrees!!! Brrrrrrrr……..!!! But sunny! Ft. Lauderdale, Fl. It’s a beautiful 64 degrees with bright sun and blue skies! Matoaca, VA Outside temperature is 20 but it started out at 8. We have a SNOW DAY tomorrow! Oceanport, NJ 24 degrees and snow! Waconia, MN 10 degrees…..highest temp in a weel! Selma, AL It was 21 degrees this morning when we woke up!! Ice is dangling from the rooftops!! Woodstock, VA It’s 18 degrees at 3:00pm! It’s warming up. It’s 24 degrees today. Carnegie, PA ( suburb of Pittsburgh) It’s 19 degrees. Knoxville, TN. It’s 23 degrees. We have very icy roads and I’m hoping tomorrow is a snow doy. 15 degress outside which is a heat wave. Real feel 4 degrees with the wind chill. Still a HEAT wave. It has been below zero with the wind chill for almost a week now!!!! I can’t wait for tomorrow it is supposed to be 28!!!!! Lyles, Tennessee (Hickman Co.) It is 25 degrees and we have snow on the ground! It’s a balmy 7 degrees outside… the rest of the country is covered with snow, and we barely have a trace on the ground!! West Chester PA. 21 degrees. Marcellus New York (outside of Syracuse) 8 degrees! up from -8!!!! Miami, Florida it is 66 degrees. Some people are wearing short sleeves and others are wearing light sweaters. Mitchell, SD The outside temp. is 0 degrees with a windchill of -20. The heaters cannot even keep up with anything. No outside recess for 4 days. Gaithersburg, MD It is partly cloudy with outside temp at 20 degrees. In St. Paul, MN it is currently +12 degrees with a wind chill of -1 degrees. This is the warmest it has been since last Tuesday! Yeah! Montgomery, TX. Currently sunny and a much warmer 48 degrees considering it was 28 and overcast on Friday. We will be back in the 70’s! Tobyhanna, PA. It’s 13, but fells like -1. I am from Pekin, Il. I teach in Peoria, Il. We return to school tomorrow, January 9, 2017. It is a sunny 13 degrees out right now. Currently it is 18 degrees, but feels like 7. We’re actually warming up! Kinsley, KS Temp is 40 & much warmer than it has been! Recess outside this week-Yes! Allentown, PA 23 degrees! brrrrrr! Richmond, Virginia. 23 degrees with lots of snow and a snow day tomorrow! 19 degrees right now. Had a light dusting of snow yesterday. Hilo,Hawaii is 60 at night. We do have snow at the top o Mauna Kea, and people bring it down in their pick up trucks to build snowmen in front yards. Ceres, CA and 62º and pouring down rain that we desperately need! Butner, NC- 4 inches of snow- now zero degrees. Atascadero, Ca 65, windy and raining. Burlington, WI 14 degrees curently. This is a heat wave, last week it was 4 days of indoor recess–but we are still standing ha ha ha! Hi, Turin, NY- 45 minutes above Utica, NY it 12 degress and is to get to -7 tonight. It is 14 degrees outside and we have a 2 hour delay tomorrow, due to icy roads and low temperature in the morning of 2 degrees. Hi from Springfield, New Jersey. It’s 22 degrees here. ? Live in Greensboro – just out W. Market St from the offices. 🙂 10″ of snow yesterday and right now it feels like 13 degrees. That’s warm compared to the 2 degrees this morning. Brrrrr…. Boone, NC and it’s a chilly 3 degrees! Boone, NC and it’s a 3 degrees! Canal Winchester, Ohio 13 degrees on January 8 at 7:15 pm. Highland, Illinois. Bbrrrrr. 14 degrees! Even The Arch is cold. We got 9 inches of snow!!! It’s only 43 degrees here in Granbury, TX but we just had 18 degrees windchill along with snow this past week. That’s cold to me. Bealeton, VA; currently 26 degrees with a feel like temperature of 11 degrees. It was much colder this morning, Brrr!! It is 13 degrees F.
Ossian, IN 10 degrees with windchill 1 degree BRR!! High tomorrow predicted to be 47 degrees. 2 degrees. Back to school tomorrow after 2 snow days. We are expecting 5-10 cm of snowfall by tomorrow evening. Perfect snowman weather! 41 degrees but it should be in the 70’s later this week. Harrison NY and a lovely 15 degrees today! Halifax, VA The temperature is 15 degrees and we have 6 inches of snow on the ground. Waterville, Ohio with a chilly 15 degrees, but its the wind that gets you! It is winter and it is Ohio, so we just roll with it! Love to see the warmer temps out west and just dream! Charleston, WV and 13 degrees at 5:12 AM. Worcester, MA and 4 degrees with a wind chill of -14 degrees….brrrrrr! Appleton, MN and 1 degree with snow on the way! Meyersdale, PA 6 degrees with real feel -3…burrish!! Monroe Township, New Jersey and 5 degrees this morning! The current temperature is 19 degrees. Brrrr! Seneca, SC and 25 degrees. 51 degrees (suppose to be a lovely 74 today!! Where’s the snow? 5 degrees here in Massachusetts. 17 inches of snow Saturday. You have to love winter!! Winchester, MA 8 Degrees today. It has been below 0 here in Manteno Illinois, but will be 40 by tomorrow! Portsmouth, VA 20 degrees. 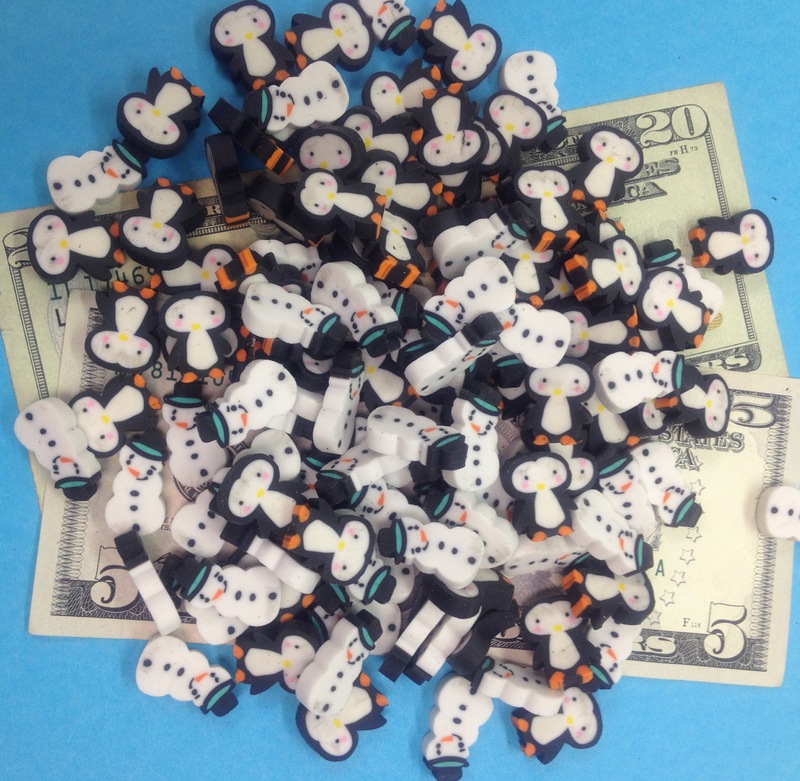 LOVE those snowmen erasers! We’re making snow and snowman soup this week! It’s a chilly 25 degrees. We hope to make ice cream this week with snow and ice! We hope to make ice cream with snow and ice from outside. Yesterday was -2 and today is warming up to a blistering 37 degrees with rain. 7 degrees this AM when I got up! Danville, Il – 22 degrees. feels like 12 degrees! Really hoping for a big snow storm!! Knoxville, TN, currently 19 degrees with snow on the ground!! Big Spring, TX, 36 degrees. Haven’t seen snow this year, but we’re making our own snow in the library this week. After below zero last week, it’s 60 in Denver today! Yeah! Morris Plains, NJ, 16 degrees and freezing rain expected soon. Greensboro, NC now a chilly 19 degrees! Spring Valley, WI — a balmy 22* at 10:30 AM!!!! It is definitely winter here!! Chestermere, Alberta, Canada (10 minutes east of Calgary, Alberta). It is currently -22 Celsius (- 8 F) with a wind chill of -33 Celsius (- 27 F). No outdoor recess for the kids today! Charlotte NC and it’s 31 degrees outside . Sunny Miami, Florida and the temperature outside today is 70 degrees at 3:00 pm This is a cool day for us! LOL! Indianola, IA 50125 27 degrees BRRRRR! Crestwood, ky -39 degrees , All our snow is melting? Philadelphia Pa 19111 23 degrees and dropping as the sun sets. Troy, Tennessee, 24 degrees! Sunny with a cold wind from the north. Joseph, Oregon 29 degrees with snow on the horizon! Northwood, OH – We are up to a toasty 28 degrees from 8 degrees on Sunday! Tucson, AZ 68 degrees ? Sheboygan, Wisconsin and it’s a balmy 29 degrees which is a great improvement from the -13 degrees over the weekend! Barnwell, SC currently 33 degrees. We missed out on our chance of snow over the past week-end. Colleen G. Minot, North Dakota…About 50 inches of snow on the ground. It was a balmy 1 above zero today but did not have outside recess as the wind chill was colder than -15. We go out until it gets to be -15 with windchill. The other day we had a heat wave with 5 above when I had recess duty! This week Thursday could see -29 temps…not windchill. Brr! Sault Ste. Marie, MI – 20 degrees with a chance 0f 5-8 inches of snow overnight to tomorrow! Manassas, Va where it is 21°. Upper Halfway, BC, Canada. A frosty -22C today. Parkersburg, WV. It is 32 degrees. Indio, CA. It is 60 degrees. Port Orchard, WA. It’s 36 degrees out right now. Hartford City, IN. 35 degrees, icy and 2 hour school delay! It’s 36 degrees in Wake Forest, NC. This is our 2nd day off of school due to icy roads! Our frosty fun includes a snow day on the first official day back for students, followed by a 2-hr delay, followed by a massive wind storm (101mph winds-also rated as category II hurricane winds) that caused major power outages and damages. Then, today,, I have no school again due to continuing power outage in our building. Happy winter! 40 degrees now. School closed due to icy roads from previous freezing cold weather. Pennsauken, NJ 08110. 32 deg with 40% chance of snow beginning at 1pm!! It’s 64 degrees and cloudy outside today! Grafton, Ohio Its about 40 degrees today, but still a snow day because of freezing rain this morning!! It’s 14 degrees and raining. Hackettstown, New Jersey An unseasonably cold 14* today, but will warm up to 40 tomorrow! Currently 0 degrees with a windchill of -21. 13 degrees and 10 inches of snow! 36 degrees, expecting 54 degrees later today. We’re having a heatwave! West Seneca, New York 42 degrees. We are having a January thaw! Pat Hunter It’s a cold and dreary day. Still outside recess though. A snowstorm 4 days ago and 50 today!! January 12th, we are enjoying an “ice day” off! The temp went from 40 to 27 over night and froze all the rain we had here in Grand Rapids, MI! The temp today was at least 64 degrees after having a three hour delayed opening yesterday for the freezing rain and ice! Tired of the weather?? ?……..wait a little while, it will change! Fort Washakie Wyoming. On Friday, January 13 we started the school day at 2 degrees. Columbus, Ohio 33* We just missed the weekend’s big ice storm. YES!